Established in 1964, Dublin based Bentley Instrument Company is a local well established Instrumentation Sales, Service (commissioning and repairs) and calibration business with a strong reputation within the Irish Food & Beverage, Dairy, Pharmaceutical & Industrial sectors. Bentley Instrument company is part of the UK based Rototherm Group, a leading global manufacturer for measurement solutions for temperature, level, pressure, density and flow. Being part of the Rototherm group we benefit from the added ability to offer our customers a specialist service, with highly technical knowledge and expertise derived through our instrumentation heritage dating back to the 1840s. Our business model is customer focused with a very strong emphasis on customer satisfaction and after sales service. 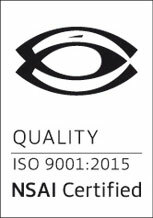 Bentley Instruments holds the ISO 9002 Quality assurance.